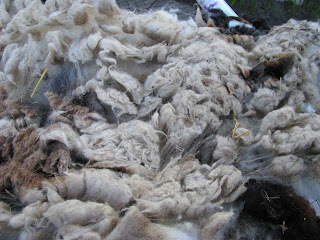 Dirty side of the Jacob fleece, filled with cockle burrs, grass, or hay, from improper feeding and pasture care. 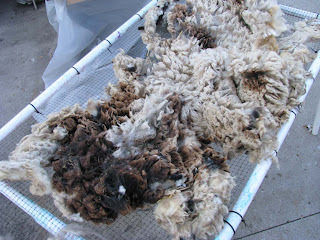 I intentionally left the picture files large so you could click on them and see the detail areas of the fleece. 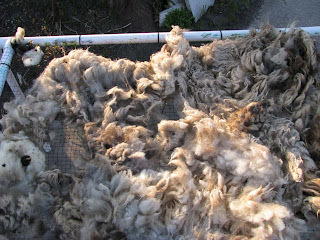 The cut or clean side of the same fleece, see the potential! Dingle berry, or turd, either way it should have been removed BEFORE the fleece was put into the bag. Cockle burrs, gazillions of them, and this pasture was reportedly clean of burrs, a little bit of round up would be a blessing in this pasture! Or a teenager with a weed hook, whichever the farmer wishes to do, but burrs seriously decrease the value of ANY wool fleece. 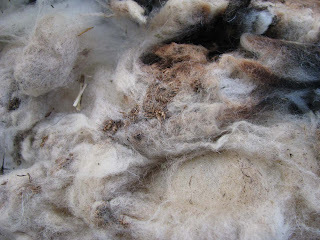 I'll spend hours picking the burrs out of this fleece to get it ready for market. 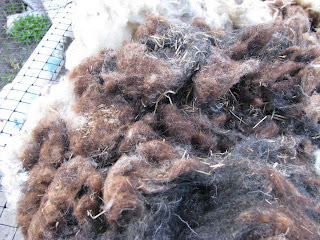 Hay was fed to the sheep in big round bales, well sheep like to rub against objects to scratch an itch and this is the end result, lots of vegetable matter (VM) in the fleece, again many hours of cleaning this to make it ready for market. 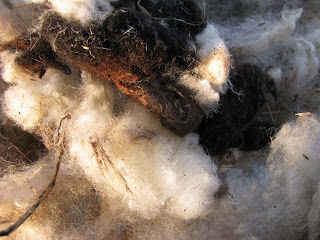 More hay embedded in the wool. 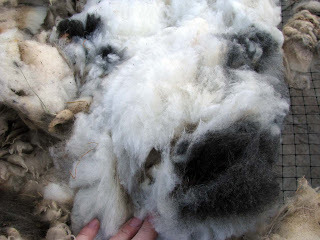 Black and white Jacob fleece that needs some TLC, it's full of burrs, needs to be skirted, and then washed before it can be put up for sale. Below: Lilac Jacob Fleece, the fleece is very soft, but a mess none the less. I can't wait to see the final product. A picture speaks a thousand words right, then these are speaking mega bytes of words!!! 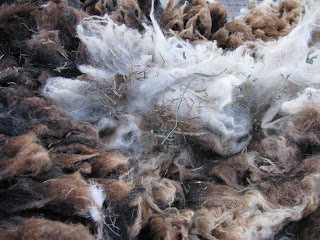 I think it should go without saying that if you are really wanting top dollar for the wool you are growing then you need to keep your pastures clean of burrs, and other vegetable matter.